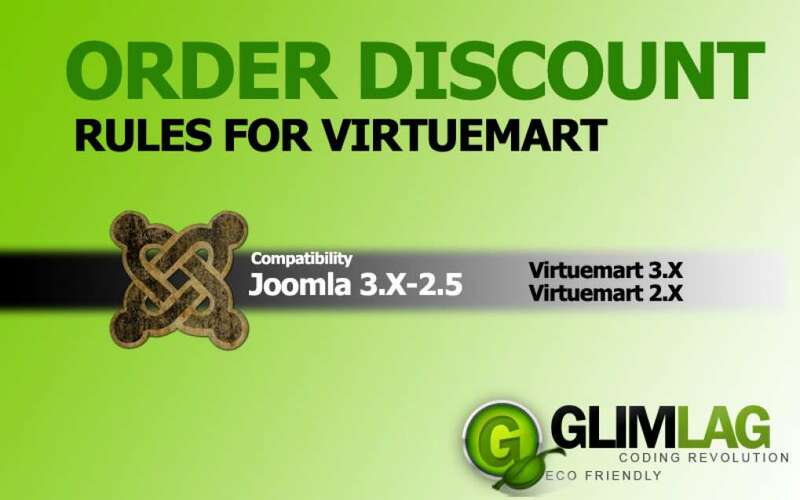 Order Discount Rules for Virtuemart is a plugin for giving direct cart discounts depending on the order total. Order Discount Rules for Virtuemart applies discounts on cart depending on the order subtotal or subtotal without tax (you can select what is the best for you). Up to 5 (five) discount rules. HOW IT WORKS: Fill the limits in the plugin parameters (for example, i want a discount of 11% for all the orders that their subtotal is between 110 € and 220€). That's it! The discount is applied automatically (no need of discount coupons or anything else). A simple and easy way to create customized promotions for your eshop! 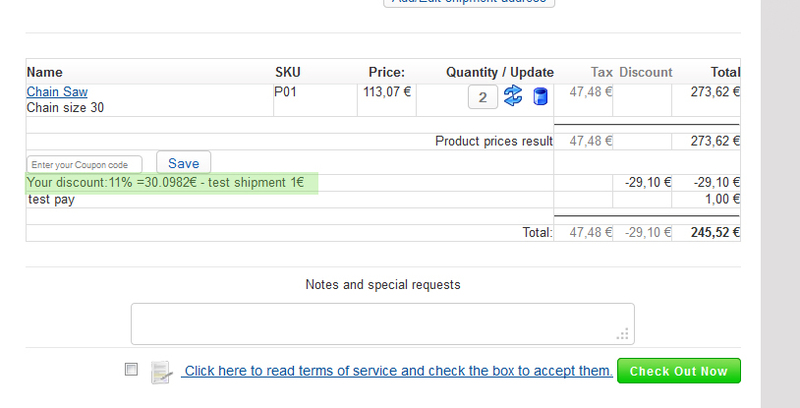 NOTE: In Joomla 2.5 Order Discount Rules is a VMShipment plugin and the discount is applied on shipping costs. 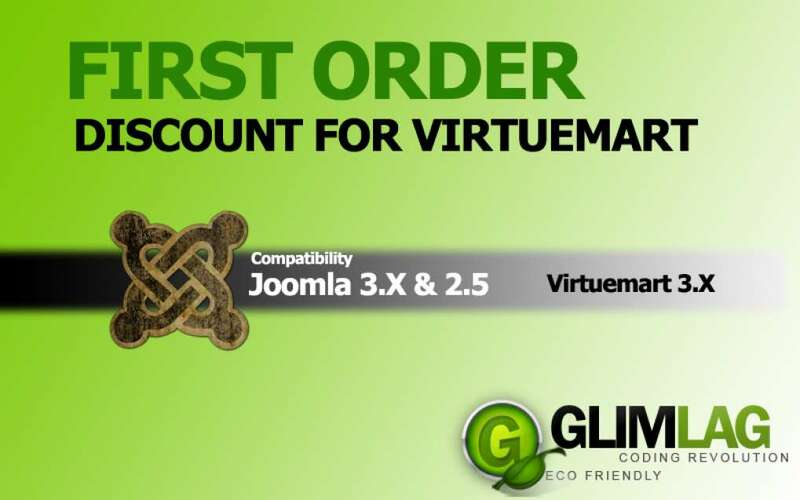 In Joomla 3.X Order Discount Rules is a system plugin and the discount is applied directly on cart. First Order Discount is a component that gives a discount for every new user in your site by generating a new coupon and add it on cart automatically in his first order. The process is as follows: User1 registers on site. A new discount coupon is generated. The user adds some products on cart. The discount coupon is added on cart automatically. When User1 confirms the order, the discount coupon is disabled automatically so that it cannot be used again. A simple and easy way to gain new customers and make them happy! Install and get it working in 2 minutes. Report of the generated codes detailing: Name of each coupon, Awarded Username, Amount. The component has license per Domain ! Please fill your domain at the comments field an the checkout and we will send you the license via email. Zip file contains both Joomla 2.5 and Joomla 3.X files. VM Coupons is the ultimate tool for issuing discount coupons for Virtuemart. 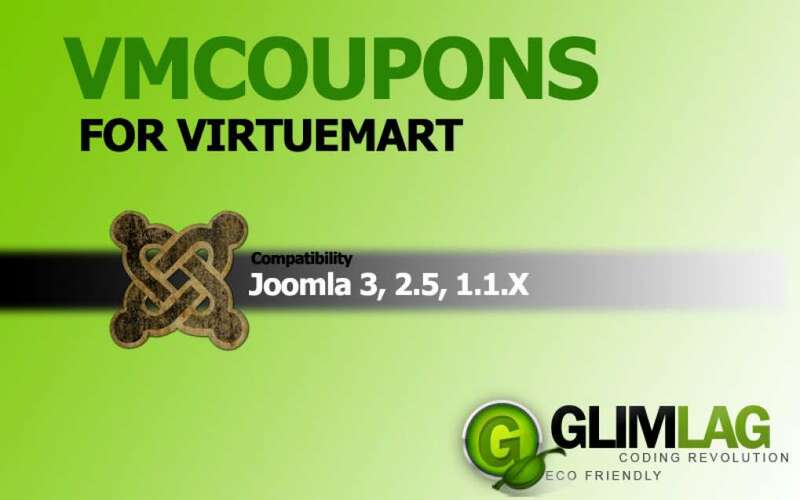 It allows you to issue up to 14 different types of coupons in your VirtueMart e-shop. It provides you with full control over the generated coupons while it shares the same graphic interface with Joomla making it easy and efficient to work on. 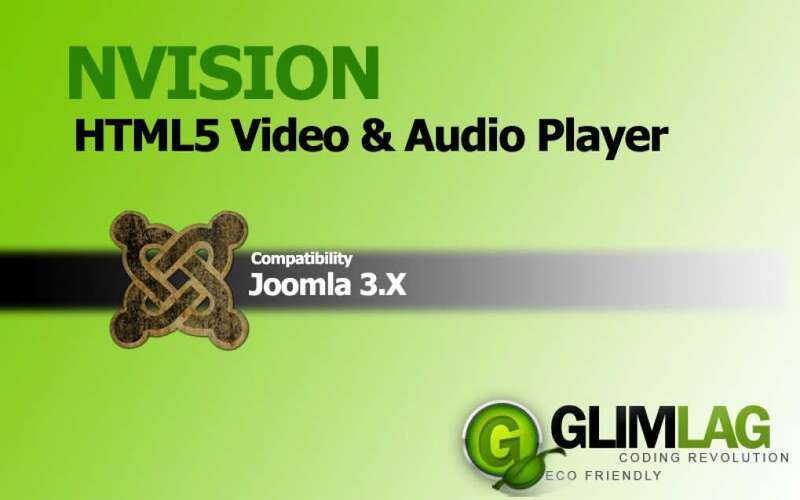 "GlimLag VM Coupons was awarded Best Web Tool 2012 by the WHS Team." 1. When a user registers. 2. When an order exceeds a specific amount. 3. When a specific product is ordered. 4. When a registered user invites friends to the site(Confirmation is made when the friend register online). 5. When a registered user invites friends to subscribe on ccNewsletter. 6. Coupon issued based on the payment method. 7. Coupon issued based on the name of the user (You can issue coupons to customers on their namesday). 8. Coupon issued based on the user shopper group. 9. Coupon issued for a specific product category. Create custom discount coupons manually. 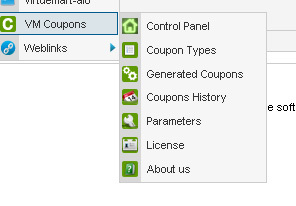 Assign the manually created coupon to specific users, products, categories, user groups, countries and states. Minimum order amount option for the coupon to be available. Editing of generated coupons is made more easy. You can see if they are assigned to states, countries, products etc. CouponsAlarm now has 3 different mail alerts. You can send up to 3 alerts on different dates before the coupon expires. Useful HINTS that you can use on all email templates and SMS texts, so that to display username, coupon code, amount of coupon etc. Language support for both backend and frontend. Try the new 4.3 version of VM Coupons. 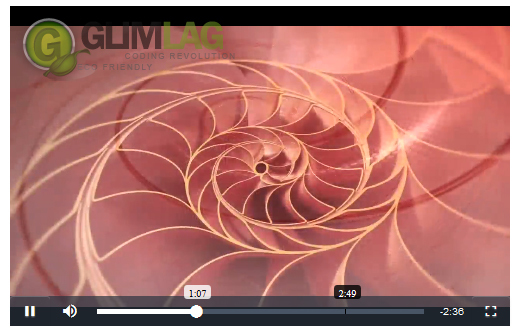 Video Tutorials on how to configure and use Glimlag VM Coupons. • Compatible with VirtueMart 1.1.2 to 1.1.9 versions and VM 2.X & 3 versions, included instructions for all Virtuemart versions. You must know that the discount is applied on cart. • For VM 1.1.x you have to modify Two(2) files in VirtueMart for the component to work. • For VM 2.X & 3 you have to modify One(1) file in Virtuemart for the component to work. The component has license per Domain ! Please fill your domain at the comments field an the checkout and we will send you the license via email. This file includes v. 4.0 for Virtuemart 2.0.X also. For more info please DOWNLOAD the VMCoupons manual. HikaCoupons is the ultimate tool for issuing discount coupons for HikaShop. It allows you to issue discount coupons with up to 13different ways in your Hikashop e-shop. It provides you with full control over the generated coupons while it shares the same graphic interface with Joomla making it easy and efficient to work on. 2. You save and publish the coupon type. * NOTE: All discount coupons are generated when the order is set to confirmed. 2. When an order exceeds a certain purchace amount. 3. When a specific product is sold. 4. When a registered user invites friends of his, to the site(Confirmation is made when the friend registers onsite). 5. When a registered user invites friends of his, to subscribe on ccNewsletter. 5. When a registered user invites friends of his, to subscribe on Acymailing. 7. Coupon issued based on the payment method. 8. Coupon issued based on the name of the user(You can issue coupons to customer on their namesday). 9. Coupon issued based on the user shopper group. 10. Coupon issued for a specific product category. Plugin for sending alerts automatically X days before coupon expiration.